We both slept fairly well last night after the bear scare. Sleeping in the middle of the trail could have been a bad thing if the bear would have come along. After our morning coffee and oatmeal we set off to get closer to Kennedy Meadows. After a few miles Paul notices bear prints in the trail again only this time it’s different. It’s daylight, the prints are much smaller, and there are two pairs of prints. One set of prints is large and the other small. Momma and baby bear? Once again eyes forward and who needs coffee any more. We followed the tracks for a 1/2 mile or so before they turned off trail and up hill. This is bear country and our resupply box at Kennedy Meadows has our “bear proof” food barrels that are required for the next 300 miles. These are Black bears not known for being man killers, but are best known for stealing food in camp grounds. Not to say we’re not a bit worried, just trying to convince myself everything is totally fine. Most of the trail is ups and downs and we reach Chimney Creek just after noon and found the spring flowing with clear cool water. We felt lazy so we took an extended siesta after lunch with a hiker named Miles. Miles is from Tennessee and we could have guessed this when he said “Where you all from”? We exchanged our home info, when we started our hike, and how many miles we average each day. This is the typical conversation hikers have when they first meet. After the siesta and the moaning and groaning, that comes along with stretching we packed up to complete the goal of 16 miles. This would then cut the miles down to 15 to Kennedy Meadows, a shower, and a hot meal. Before leaving though another hiker named GoalTech came through SOBO. He was section hiking and doing on-trail trail magic as he was carrying a satchel with small bags of chips and via coffee. We chose chips. 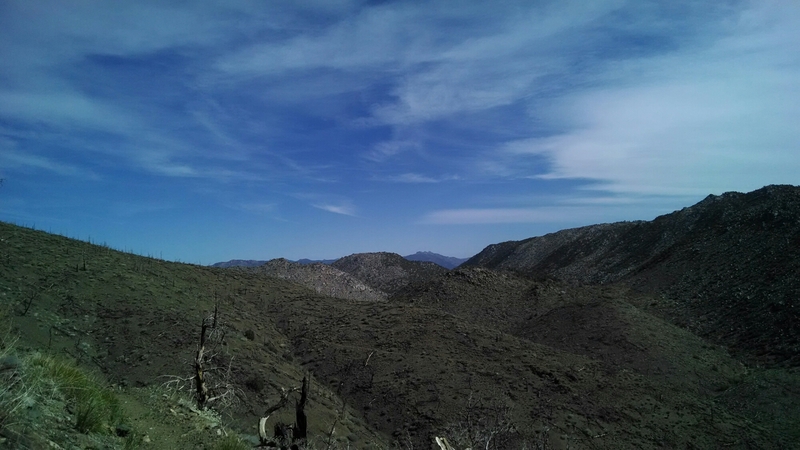 As we exchanged trail names, he lit up and said, “2moremiles…yours’ is one of the blogs I’m following”. Cool beans, another fan. He asked, and took our picture. We snapped his as well. Once again the terrain went from a beautiful forest to an old fire burnt forest which we walked through until night. Since the wind had come up we were looking for some kind of wind blind. We saw a small stand of pines on top of a knoll that was spared from the fire about 100 yards downhill and off the trail. It was perfect, we made camp and dinner before it became completely dark. It was then when Mammoth appeared from behind with a big “hello!” We both spun around and said “Holy Sh#@!” Mammoth apologized up and down for the scare and asked if he could camp with us. He said he was trying to get out of the wind, but later he told us how he ran into a bear, face to face and was a little uneasy ever since. We shared our bear print stories and that we were a little on edge too. Obviously! Mammoth is 20 years old, 6-4 and has walked to California form New York. Now he wanted to walk to Canada. What next we asked? Mammoth’s response was a shrug of the shoulders and a big smile. Gotta love this kid. Great to meet you two! 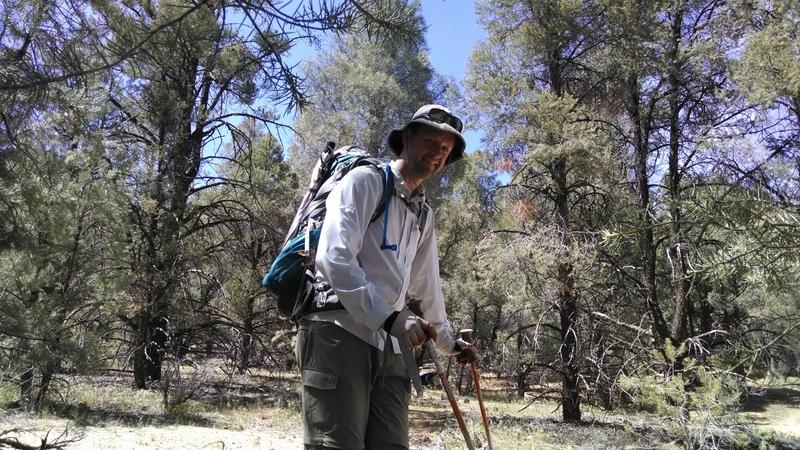 I made it to Tehachapi Pass yesterday providing magic to 279 thru hikers. I’ll be staying tunes to your blog. Have fun!